As articulated in Energy 20/20, my blueprint for a new U.S. energy policy conversation, I believe there is a consensus that it is in our national interest to make energy abundant, affordable, clean, diverse and secure. In addressing these goals, too often affordability is ignored – despite the difficult choices increasing energy costs impose on Americans. In particular, low-income households are highly vulnerable to energy prices because energy bills make up a larger percentage of their living expenses. These families are energy insecure, defined as the inability to afford to maintain a home at a reasonable temperature and the loss of access through cessation of service due to non-payment or other factors. 7 million additional people across the U.S. spending more than 10% of their gross household income on home energy, the threshold for entering energy insecurity. Energy price increases often crowd out or eliminate other household essentials, including food, clothing, medical care and education, forcing low-income households to make difficult tradeoffs. The effects of these sacrifices are heightened odds of food insecurity, more frequent relocations, poorer health, decreased educational achievement and reduced productivity. Programs such as LIHEAP are limited in addressing an issue of this scope by a number of factors. Any policy proposal that would increase the cost of energy should therefore be fully evaluated for its impact on energy insecurity, in order to give policymakers a complete picture of its potential consequences. How can these new tools, the IEIs, inform the discussion of the nexus between energy policy and the affordability of energy? Why has this nexus received comparatively little attention? How best can federal policy help relieve energy insecurity and decrease costs for the American people? How can these new tools, the IEIs, inform the discussion of the nexus between energy policy and the affordability of energy? How best can federal policy help relieve energy insecurity and decrease costs for the American people? Continued emissions of greenhouse gases due to the burning of fossil fuels poses a clear and present danger to the United States and its citizens. It is widely recognized that climate change impacts will disproportionately impact the poor. IEI’s should include the climate impacts on the poor (e.g., rising food, housing, insurance, and health costs) in addition to rising energy costs. Fortunately, there is a potential federal energy policy that will lower greenhouse gas emissions, create millions of jobs, grow the economy, and help — not hurt — the poor. With a “Fee and Dividend” policy, a rising price is put on the carbon content of fossil fuels. The fee is paid by the fossil fuel companies at the mine, well, or port of entry. 100% of the money collected — every penny — is paid out to every legal resident on an equal basis. Because wealthily citizens generate far more CO2 than the average citizen and because the government generates a lot of CO2 and does not receive a dividend, most people — especially low CO2 emitters — would earn more from the dividend than they pay in higher energy and product prices! An economic analysis of this Fee and Dividend policy shows that it will, over 20 years, create 2.8 million jobs, grow GDP by $1.4 trillion, and cut emissions 52%. It would be interesting to see how IEI’s are impacted by Fee and Dividend. Representative Van Hollen has introduced a similar “Cap and Dividend” policy and that is discussed on a separate thread on this forum. It is not climate change, but ill-advised climate change mitigation policies which are a clear and present danger to Americans and to the rest of the world. 1. There is no evidence of increased hurricanes or droughts or floods in the 20th or 21st centuries, and the 2007 IPCC AR4 report conclusions on these topics have been officially recanted. In fact the archaeological evidence of past flooding events indicates stormy weather was milder in the 20th century than in any of the preceding 5 centuries. 2. The 15-year hiatus in global mean surface temperature (GMST) warming since 1998 is real and points out the failure of the official CO2-based climate models in grossly over-predicting temperature rise. Additionally, 3 of 5 studies found that ocean warming has also slowed during this time. 3. Factors other than CO2 such as solar variability, particulates, plant aerosols, and clouds must be more influential on climate than previously credited. 4. There is little evidence and no consensus among these several thousand IPCC scientists of any abrupt or catastrophic climate change occurring in the 21st century, and there is no evidence of critical tipping points or the irreversibility of climate change effects such as polar ice loss. 5. The IPCC prediction for the most likely amount of sea level rise is just over 2 meters by the year 2500, and this pace is far lower than the average pace of rise for the past 18,000 years since the last ice age. 6. The surface mass balance of ice in both the Arctic and Antarctic is positive (ice is increasing over land), and global-scale ice coverage is stable, despite regional gains and losses. Also, the small bit of warming over the past century and a half (0.8 deg C) has actually done more good than harm to the biosphere and to human civilization. According to the UN IPCC, disease is decreasing, plant growth, land coverage, and food crop yields are increasing, and cold weather deaths continue to vastly outnumber warm weather deaths. To find these surprising conclusions, it is necessary to read the full 2,216-page scientific report (http://www.climatechange2013.org/images/uploads/WGIAR5_WGI-12Doc2b_FinalDraft_All.pdf ). Note, most people only read the Summary for Policy Makers which is a non-scientific document crafted by political representatives to the UN to carry the water of their sponsors, and actually contains language not found in the scientific document and conclusions that are contradictory to it. As to the disastrous energy policies that western nations have enacted, their immediate and lethal consequences include the diversion of food agriculture resources to biofuels, an enduring 40% increase in the cost of food and corresponding increase in global food insecurity, the green-grabbing of millions of acres of land and water rights in the world’s poorest nations, the deforestation of biodiverse, primeval carbon-sink forest and peat lands for conversion to biofuel plantations of non-native cultivated mono-cultures, increased stress on limited water and mineral resources, increased lifecycle emissions of CO2 and particulates that increase human mortality, increased price of energy from the unsustainable subsidization of arbitrarily intermittent and low capacity-factor energy sources such as solar and wind that is increasing energy poverty across Europe and the United States, etc. It is the immediate harmful effects of bad climate change policies, not climate change itself, that is eroding international security and causing such violent events as the bread riots in Egypt which became the revolution that ousted Mubarak. When policies achieve the exact opposite of their intended goals by increasing GHG and polluting emissions, reducing biodiversity, increasing global hunger and unrest, and increasing the human death rate, they are clearly epic failures that need to be abandoned. 2. Hiatus in global warming?? 2005 and 2010 were the warmest years since temperature records began and 2014 is on track to be warmer still. You can’t have peaks during a pause! 3. Solar variability and other factors lead to a cooler world. The IPCC said that man is responsible for 110% of the recent warming. In other words, without man’s contribution to global warming, the Earth would be cooling now! 4. Scientists don’t talk about tipping points? Huh? The IPCC does. How about the recent NASA announcement that the West Antarctic glaciers have passed a tipping point and their collapse is now “unstoppable”? This will lead to 1m SLR directly and 10+ feet in the next few hundred years. Add accelerating loss of Greenland ice and I would advise against buying land in Florida. 5. 2m SLR by 2500? We can wish. But 2m is the high end of the IPCC predictions for this century. And some climate scientists say 2m is the minimum SLR this century under BAU. Greenland ice loss has been doubling every 5 to 10 years. Exponentials are not our friend. 6. Greenland and Antarctic mass change is positive? Sorry, wrong. GRACE satellites can measure mass loss directly. You think that the IPCC’s own summary of their work is “political” so you link to an outside group’s cherry-picked summary as accurate? Sorry, no. I will agree with you that some “green” policies have had unintended consequences, especially around biofuels. But fossil fuel policies have had and will have far more negative impacts. The $1 trillion war in Iraq was about protecting oil supplies, as one “small” example. Climate change is a big example. Also, the trigger of the Arab Spring was high food prices caused by the climate change-linked heat wave and drought in Russia in 2010 (a 3-sigma event). Because of massive crop failure, Russia stopped exporting grain and that caused world food prices to spike. That led to food riots in Tunisia that spread to other countries in the region. But smart policies that put a price on the “bad thing” (CO2) and refund the collected revenues to the public will create millions of jobs and grow the economy. It’s a good thing to do even if you don’t believe in climate change! Here are direct quotes from the 2013 IPCC AR5 WG1 report. This report was written by thousands of international climate scientists and represents the authoritative climate consensus. It recants many of the alarmist claims made in the 2007 AR4 report. It is rich to see alarmists like you now deny the IPCC itself to maintain your worldview. It really gets interesting when the reader gets to the part where the report discusses total solar irradiance and formally recognizes the greater variability of the sun in UV and how this couples with the recently recognized sensitivity of upper level cloud formation to UV radiation. Chapter 11 of AR5 even acknowledges that human disease and mortality rates are predicted to fall, plucking another arrow of doom from the alarmists’ quiver. WHO estimates the global burden of disease (measured in Disability Adjusted Life Years per capita) will decrease by 30% by 2030, compared with 2004 (World Health Organization, 2008a; World Health Organization, 2008b). The bottom line is that the 2013 AR5 report dramatically tones down the alarmism and opens the range of uncertainty on climate change, and offers a far more moderate view than the 2007 AR4 report. One shouldn’t attack people who are informed of the latest and best science in the 2013 IPCC report based on one’s outdated 2007 Al Gore Powerpoint worldview. Ike: Quoting the IPCC is fine, but your translations are incorrect. When the IPCC says “low confidence” it does not mean they have low confidence that the item being discussed is true! It means that there is a large standard deviation bounding the item being discussed. “Climate change will affect the Department of Defense’s ability to defend the nation and poses immediate risks to U.S. national security,” the report reads. Yes I am aware that current administration political appointees are pushing bad policies in the name of climate change alarmism. That is why I wrote this and this while still on active duty. The diversion of food resources to biofuels production has resulted in an enduring 40% increase in the cost of food, the green-grabbing of millions of acres of land in the world’s poorest nations, the deforestation of primeval carbon-sink forest and peat lands, increased stress on limited water and mineral resources, and the increased emissions of CO2 and particulates that increase human mortality rates. It is the immediate harmful effects of bad climate change policies, not climate change itself, that is eroding international security and causing such violent events as the bread riots in Egypt which became the revolution that ousted Mubarak. The US military, principal proponent of biofuels, is one of the leading culprits. In the US military, there can be quite a difference between what the political appointees say and publish, and the genuine sentiment of the uniformed military leadership. My views are shaped by years of research in various schoolhouses and years of working strategy in the Pentagon. I am not alone in my views. See this award-winning piece published in Joint Forces Quarterly, the magazine that belongs to the Chairman of the Joint Chiefs of Staff http://ndupress.ndu.edu/Media/News/NewsArticleView/tabid/7849/Article/8465/jfq-73-green-peace-can-biofuels-accelerate-energy-security.aspx. Here is something from the Navy in Norfolk where the land is sinking and the sea is rising … The DOD is taking actions where the state of Virginia can’t even say ‘Climate Change’. See my comment to Dan above about the often large disparity in subject matter expertise, strategic acumen, and tactical expertise between political appointees kissing up to their bosses and the rank-and-file professionals in the military that grew up in the trenches and studied their history. Also, if you are remotely versed in beltway self-promotion, you know that all the think tanks seize upon or dream up signature crises as a brand to promote themselves. The Secretary of the Navy has made the Navy brand climate change and biofuels and RE, and CNA is happy to suit him to chase the FFRDC dollars. The Air Force made their brand China and Air-Sea Battle, and CSIS is likewise happy to oblige them and pump that threat. There is little merit to an argument that points to political leadership as a bellwether for scientific prudence. Look at how they are handling ebola right now. Ike … I did see your comment above. My thought was to mention the Hampton Roads, Norfolk area where the flooding is causing owners of real estate there, including the DOD, to become very practical about mitigation. What can be done …. what is worth doing … and how expensive is it all going to be? Study is underway. The area is discussed at length pretty far down in the report. As I said … the land is sinking and the sea is rising and the area is one of the most vulnerable in the country. DOD is addressing the flooding, and the Climate issue, without political shenanigans as the VA legislature has so far refused to acknowledge anything amiss. You say “sinking” and “flooding” as if the water is lapping at the doors. The global sea level has been rising for 18,000 years since the heart of the last ice age, and the current rate is slower than it was for most of that time. We have been adapting for thousands of years and we will continue to adapt into the future, whether the government foolishly and inefficiently forces it from the top, or whether property owners do it naturally themselves. Being ready for severe weather has always been a good idea, at is has always been a threat throughout all of history. Good for the Navy in Virginia for finally figuring this out after 6 millennia of human history. BTW, sea levels are currently falling on the US west coast. Do you think people should push their houses closer to the sea and the Navy should lower its piers? How about we all just take a deep breath and realize it is always risky to build on seacoasts and coral atolls, and that the daily tides and guaranteed storm surges and rare tsunamis that seacoast structures should all be zoned and designed for dwarf the millimeters of change in sea level. “Poor People in the Environment’, Clearinghouse Review (Jan. 1972) sketched out why poor people are more harmed by pollution than any other group.What Senator Murkowski states should be intuitive. “External Entropy” (2014 ed.) has sought an empirical structure for energy decision-making, including all costs, including social costs. Some form of carbon fee, tax or regulatory structure would be fairer to poor people, particularly the elderly who often pay an extraordinary amount of their income for utilities yet have a wonderful load factor, but is unlikely to be adopted. A more modest goal would be to improve the Public Utility Regulatory Policy Act of 1978 (PURPA), which had bi-partisan support, with an amendment requiring a match between wholesale and retail rate policy, administered by FERC, and at least including all costs in gas and electric pipeline/transmission rates. This could benefit the poor. Environmental, consumer and low income advocates should come together AGAIN with rational, moderate legislators to find out how a level playing field would work where all the options from energy efficiency, cogeneration, wind, solar, nuclear, biomass, hydro, and natural gas are objectively evaluated in their total effect on the world and its most disadvantaged citizens. The IEI concept should be part of the standards adopted. Senator Murkowski should reach out to Senator Markey (D-MA), who was the key sponsor of PURPA in the House, to see how a rethinking, using IEI, could be enacted. The pollution that most hurts poor people is not the exhaust of fossil fuel power plants, it is the smoke from wood and straw and charcoal and dung biomass burned inside their homes when electricity and natural gas are not available or are too expensive. The WHO estimates that 4 million people a year die from this indoor air pollution, and that it is the number one killer of children under 5 years of age. Europe’s and North America’s unwise and unsustainable subsidization of arbitrarily intermittent, low capacity factor, low power density, geographically remote wind and solar power, and all the duplicative attendant infrastructure required to connect and buffer and backup these low-value and low EROI resources, has necessarily driven up electricity prices throughout these nations faster than inflation since 2005 and driven millions of their citizens back down into energy poverty. Some of these newly impoverished folks are going into the national forests and cutting down trees to heat their homes in the winter. Others are turning down their thermostats and becoming winter mortality statistics. The governments of the western world should be shamed by policies whose outcomes are the reversal of a century of improvement to instead increase poverty and mortality. The answer is to stop trying to make winners out of losers using truckloads of taxpayer cash, and let the market naturally develop the highest-EROI and lowest-priced energy sources. The huge irony behind all this is that energy efficiency was going up and energy intensity was going down right up to the point where the governments again intervened in the early 2000s, like they did in the late 1970s, and decided to force certain energy choices on their citizens from the top down. Last time Congress outlawed natural gas power plants and promoted coal plants. This time the EPA is effectively outlawing coal power plants and promoting natural gas plants. Centrally-planned economics and energy policy are working as well today for the once “free world” as they did for the USSR, leaving a legacy of shared poverty for all but the politically-connected few. Our policymakers and regulatory agencies simply cannot ignore the fact that energy costs in the United States are on the rise. Since 2001, real energy costs for middle- and low-income families have increased by a staggering 27 percent. Growing energy costs are disproportionally impacting the poorest, most vulnerable American families, who are often forced to choose between food on the table, shelter over their heads and other basic necessities just to pay skyrocketing energy bills. Coal is an affordable, abundant and increasingly clean domestic energy resource that is vital to providing reliable low-cost electricity and keeping energy costs low for American families and businesses. Unfortunately, President Obama’s regulatory assault on coal in pursuit of unpredictable and costly renewable energy sources like wind and solar has – and will – lead to greater price increases across the country. We need federal policies that support energy security through a diverse and balanced energy portfolio. And it’s critical that coal is part of the mix. Unfortunately, the damage caused by coal power — not including the impacts of climate change — exceeds the value of the electricity produced. When the impacts of climate change are included, coal is one of the most expensive forms of energy available. It is absolutely wrong to ignore the social benefits of coal electricity and only count the social costs. It remains the cheapest and fastest way to extend the benefits of electrification, and these benefits include far better, not worse, air quality than the alternative of biomass burning. For more than a billion people in Asia and Africa, coal electricity will be the means by which they first receive purified water, sewerage, heat, refrigeration, telecommunications, modern healthcare and delivery from indoor air pollution. These benefits are associated with doubling and tripling of life spans, and with rapid economic development, and no government will be able to endure in these nations that attempts to slow coal electrification and the quality-of-life improvements it brings. In the already-developed world, there are cleaner alternatives than coal electricity, but at higher cost. Moving from coal to alternatives raises prices, raises the threshold of energy poverty, and imposes costs associated with such poverty, not the least of which is increased winter mortality. Energy poverty and excess winter mortality have together been rising in Germany and the UK according to their own published data, and this has their citizens rightfully concerned. Energy poverty has also been rising in the USA, but winter mortality statistics are not available more recently than 2008. When the statistics finally come out in years hence for this past winter with its record cold temperatures and record energy prices, I expect we will see that our reckless RE subsidization policies killed a bumper crop of people. With predictions of a 30-40% increase in energy prices in the Northeast this winter, we are likely to repeat the carnage. Bad energy policy is a matter of life and death right now, and we should not knowingly be killing people today to forestall the bogeyman of a climate change threat that is not developing as forecast, and which we don’t even understand well enough yet to build computer models that have any predictive value whatsoever. Ike: The benefit of coal is that it provides electricity. There are other ways to do that that don’t cause all the problems that coal does. The external costs of burning coal are very high — higher than the value of the electricity provided! Therefore, other means of producing electricity are less expensive to society. Burning coal hurts the economy compared to other methods of producing energy. Also, most people prefer their fish without mercury. Most people also prefer living through the winter. The statistical correlation between increasing the price of electricity and excess winter mortality is very solid. And the worst alternatives to coal from the perspective of energy poverty are wind and solar. Price must be a central factor in any cost-benefit analysis of energy alternatives. Our government is subsidizing rich people who need it least like Warren Buffet with billion-dollar loan guarantees and grants (look up Agua Caliente), and subsidizing wealthier home and landowners with ITC and MACRS tax credits that add up to 60% of the project cost to install wind and solar on their land and roofs, and is then forcing the utilities to pay top dollar for every intermittent watt, and is financing this wealth transfer with increased power rates — the most regressive form of taxation we have in this country in that it hits the poor and fixed-income folks the hardest. We are subsidizing the creation of the world’s most expensive and land-hungry and low-performance forms of electricity and financing it on the backs of the poor, and sending many to early graves in the process. The EPA’s RFS is the same crime perpetrated in liquid fuels and paid for in the same regressive way by raising prices at the pump and increasing polluting emissions and even increasing lifecycle GHGs 21-33% by the EPA’s own admissions. All of these sacrifices we are making to the modern Molech of Climate Change so that he will not eat our children 100 years from now as we are assured will happen by the Climate Doomsday Priesthood. I am merely asking people to remove the hood and robes and put on a lab coat and actually align their views with the true scientific consensus. The UN IPCC scientists themselves have dramatically turned down the knob on alarmism in the 2013 report. The have made very significant retractions of dire claims made in the 2007 report (droughts, severe weather, abrupt changes, irreversible tipping points, disease, ice loss, skyrocketing temperatures). Climate change is only one of many threats facing humanity, we don’t even know its magnitude or vector very well yet, nor how much of it is anthropogenic, nor how much of it is even stoppable. Yet, our ill-informed overreaction to this threat is exacerbating many others such as poverty, hunger, water scarcity, fragile governments, global unrest, environmental damage, biodiversity reduction, reckless proliferation of GMO and non-native species, nitrate poisoning and eutrophication, ozone and carbon particulate and volatile organic polluting emissions, and even most ironically increased GHG emissions. BTW, there is more mercury in each 20-W CFL lightbulb the EPA forces you to buy (5 mg) than is released by the coal to light it for its 7,500-hr lifetime (3.5 mg). Dropping one is like having a coal plant in your house. It comes back to indoor air pollution again. Wouldn’t it be nice if government policies were based on logic and science instead of feel-good ideology and vote-buying politics. Alas. All we can do is educate. Ike: As you know, fossil fuels are heavily subsidized. A large part of the Navy’s mission is to protect oil supply routes. We spent ~$1T in Iraq. Do you think we would have been there if it wasn’t for oil? Almost all of the other problems you mentioned are being and will be exacerbated by climate change. You are wrong about the IPCC backing off about the dangers of climate change. Read the IPCC’s own summary, not a reinterpretation by a group trying to downplay climate change. Also, your comments elsewhere in this thread about sea level being something that has always varied. Well, not so much over the past 6000 years. Sea levels varied about 8 inches during that time and then rose 8 inches in just the past 150 years, with an expectation of 3 to 6 feet this century and much more after that. Note that the last time (a long time ago) that CO2 levels were as high as they are today (400 ppm), sea levels were 75 feet higher than today. It takes a long time to melt that much ice, but we’re certainly doing our part to speed it up. You said, “As you know, fossil fuels are heavily subsidized.” This claim is as dramatically incorrect as your other articles of faith on climate change. The fact is that the integrated gas & oil industry puts 20 times more money into the federal tax coffers than it receives as tax breaks and other forms of assistance. Fossil fuel, in fact, subsidizes our government and underwrites the high-energy-intensity standard of living of the developed world. It is the cash cow the sustains all the world’s petro-states. I do not hold my views based on faith or popular opinion. Let me substantiate my assertions. The DOE was tasked by Congress in 2009 to calculate all federal assistance to various forms of energy and produced a report in 2010 which remains the most recent authoritative source ( Direct Federal Financial Interventions and Subsidies in Energy in Fiscal Year 2010. Energy Information Agency, July 2011. http://www.eia.gov/analysis/requests/subsidy ). Per the above, in 2010 wind was subsidized at a rate 68 times higher than oil/gas and solar was subsidized at a rate 111 times higher (88 and 143 times higher than coal, respectively). In 2009, the Federal government collected $13.7 billion from oil and gas company corporate taxes and $42.4 billion in consumer-paid oil and gas excise taxes for a total of $56.1 billion (EIA Financial Reporting System Survey – Form EIA-28 Schedule 5112 – Analysis of Income Taxes. Energy Information Agency, 2009. ftp://ftp.eia.doe.gov/pub/energy.overview/frs/s5112.xls ). 2009 was a bad year because of the recession. In 2011, the total was more than $58.2 billion (Helman, Christopher. “Which Companies Pay The Most In Taxes?” Forbes, April 16, 2012. http://www.forbes.com/sites/christopherhelman/2012/04/16/which-megacorps-pay-megataxes/ — I would use EIA/IRS corporate tax data here but 2009 is the most recent published by the government.) This represents a 2,000% return on investment to the federal government for their oil and gas “subsidies,” and does not include more than $12 billion the federal government collects annually in land leases and permits and fees, nor the amounts collected by state and local governments (Cart, Julie. “Energy Development on Public Lands Generated $12 Billion in 2012.” Los Angeles Times, December 6, 2012. http://www.latimes.com/news/science/sciencenow/la-sci-sn-20121206-energy-income,0,4832619.story; Dlouhy, Jennifer. “Feds Collect $14.2B from Energy Development.” San Antonio Express-News, November 20, 2013. http://www.mysanantonio.com/business/eagle-ford-energy/article/Feds-collect-14-2B-from-energy-development-4997160.php ). The federal government collects more than $9/barrel in taxes against a subsidy outlay of 45 cent/barrel. That 2,000% return on investment is unmatched by wind and solar, which continue to drain federal and state and ratepayer wallets. Then there is the federal revenue from capital gains and personal income taxes. The oil and gas industry market capitalization is $1.5 trillion — equivalent to 10% of the $15 trillion US GDP. According to current Bureau of Labor Statistics employment data, the oil and gas extraction industry employs 198,000 people while wind electricity generation employs 3,200. The federal income from payroll taxes is going to be roughly proportional. The objective truth is that fossil fuel energy and profits and taxes have historically subsidized the federal government, not the other way around. They today represent about 10% of the US economy, about 40% of the economy of Russia and a much higher percentage of the economies of OPEC states. Oil and gas and coal represent 82% of US primary energy. Claiming they are subsidized betrays a complete lack of understanding of energy and economics. Ike: There are many ways to calculate subsidies. You can count taxes paid (that any other company — including renewable energy companies would pay) to offset subsidies. Of course, the cost to protect fossil fuel supply lines is a subsidy as well as the biggest subsidy of all… the ability to permanently pollute the atmosphere for free. the combined value of global fossil fuel subsidies can be difficult to calculate, with recent estimates ranging from $500 billion to $1.9 trillion. But according to the International Monetary Fund, when you factor in implicit subsidies from the failure to charge for pollution, climate change and other externalities, the post-tax cost comes in at closer to $2 trillion – equivalent to about 2.9 per cent of global GDP, or 8.5 per cent of government revenues. Once again you run from real data and cling to advocacy websites. I present IPCC direct quotes and you cite realclimate.org. 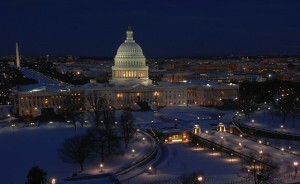 I present DOE data presented to Congress and you counter with cleantechnica.org. Who is the denier here? You like to speak of “cherry picking.” Well, you provide a great example in your 16 October comment above about rising sea levels. The most probable prediction for sea level rise based on the “medium scenarios” of 500-700 ppm CO2 as published in the 2013 IPCC AR5 has error bars centered at 50 cm by 2100 and 120 cm by 2500. Should we make policy based on the most probable scenario developed by the consensus of thousands of international climate scientists, or on a single paper that admits it is an extreme case? To put current sea level rise into historical perspective for you and Jane, here is a graph of sea level rise since the heart of the last ice age 20,000 years before present. Note that we are in a “climate optimum” of ideal conditions where sea level is near its peak and is very stable. 10,000 years ago coastal dwellers might have had something to complain about, but it sure wasn’t anthropogenic in cause. The average rate of sea level rise over the past 20,000 years has been 7 mm/yr with a peak rate of ~30 mm/yr. Current rate is estimated at 2-3 mm/yr. Ike: Thank you for the primer on sea level in the last glacial period. You see that sea levels were about 120m lower when CO2 levels were just 100ppm below the pre-industrial level of 280ppm. The CO2 concentration is now 400ppm. The last time it was that high, sea levels were 25m (~75 feet) higher than they are today. That is where we are heading (actually higher, since we are continuing to increase CO2 concentration). Of course, if it wasn’t for man’s alteration of the atmosphere, we would be beginning to slowly enter the next glacial period now (because of changes in the Earth’s orbit) and global temperatures would be cooling and sea levels would be dropping. But the opposite is occurring. And very rapidly. While our pre-agriculture ancestors probably dealt quite well with sea level rise (SLR), they did not have major cities built on the coast nor a population of over 7 billion. You note that we were at a “climate optimum” for the past 8000 years. Well, we are changing that quite rapidly now. SLR is currently at 3mm/year (up from 2mm a decade or so ago). We are losing Antarctic and Greenland land ice at an accelerating rate (currently, it appears to be an exponential rate!) so the fact that SLR rise is now “only” 3mm/year should not give us any comfort. Exponentials are not our friend. The SLR paper I cited and you referred to did say “Thus our low probability upper limit of sea level projections [of 180 cm sea level rise by 2100] cannot be considered definitive.” But you implied this meant that the upper limit may be lower than 180cm. What they meant, if you read the paper, is that due to the recent findings (that came after the paper’s research) that the West Antarctic glaciers are collapsing and their loss is now “unstoppable”, they are saying that the upper limit of 180cm may be too low. So, let’s summarize. Sea levels were 120m lower with 100ppm lower CO2 (compared to pre-industrial levels). CO2 is now 120ppm higher (and rising) and sea levels are beginning to rise after 8000 years of stability. In response, the major ice sheets are beginning to shed ice at an accelerating pace. And you think everything is hunky dory?! I will try logic one more time. Your comments make the point that past sea level rise dwarfed today’s. This is true. It also dwarfs the IPCC predictions of sea level rise for the next 500 years. The IPCCs own sea level rise predictions show how sea level rise is NOT following CO2 rise and we should less alarmed rather than more. A graphic that shows how much sea level is not rising compared to past interglacial periods helps to put this into perspective. Since this is a policy discussion forum, the application for policy makers is to realize that the climate and sea level record show that both have changed dramatically and cyclically in the past on scales that dwarf modern changes and driven by forces that had nothing to do with human activity. And furthermore, that the long-range threat encompasses both moderately warmer and significantly cooler temperatures paired with moderately higher and dramatically lower sea levels. And finally, that the current 1.0 deg F of warming and 9 inches of sea level rise since 1880 are literally in the “noise band” of historical data, and are a very weak basis from which to predict whether the future will bring warming or cooling. BTW, where in IPCC 2013 do you see prediction of exponential sea level rise? The current IPCC-recognized hiatus in GMST warming since 1998 casts further doubt upon both the durability and the cause of the preceding brief warming trend. It is unwise to be legislating multi-trillion-dollar climate “solutions” when we can’t even accurately characterize the “threat” yet, let alone pretend to be able to control it. Ike: Please. You show a graph showing results of sea level rise (SLR) over millions of years and you compare to SLR over 100 and 500 years. Ice sheets take time to melt. The last time CO2 was 400ppm — today’s value — sea levels were 25m higher than today. All you need to do is give it time and we’ll get there. And we are forcing the system more than 1000 times faster than the previous orbital change and volcanic forcings of the past, so we will not need to wait nearly as long. Based on research released this year (and, therefore, not included in the IPCC reports), we know that the West Antarctic ice sheets are collapsing and their loss is unstoppable and there are similar findings in Greenland (that glaciers are being melted from warm waters below the glaciers). As you yourself have pointed out, SLR has at times been dramatic and there is no reason to believe, given the tremendous forcing we are trying to apply, that it will not be dramatic in the next few centuries. And even this study does not include the new West Antarctica and Greenland data. In any case, 3 feet of SLR this century (which is becoming the low-end prediction) will do quite a number on Florida and many other places in the world. Surface mass balance of Antarctica is positive 2,000 GT/yr, with 25mm to 1.5m of accumulation per year depending upon basin. Net mass balance on the continent (including the loss due to ice mass that is sliding off into the ocean) is estimated at negative 80 GT/yr. So the proper conception is that there is 2,000 GT/yr more ice and snow in Antarctica each year (2,000 GT of water migrating from elsewhere in the world), but that extra 2,000 GT is pushing 2,080 GT of ice and snow out to sea to make room. The difference between gain and loss on the continent is 4% of the annual accumulation, and the uncertainties are almost that large. Alarmists focus on the 4% and ignore the 96% that completely overshadows it. The facts are that within the Antarctic circle, snowfall is increasing, ice mass is increasing, ice coverage is increasing, and the water temperature is decreasing — all of which all best explained by cooling rather than warming. And, if you will look at IPCC 2013, you will see that these 2,500 international climate scientists calculated the Antarctic contribution to sea level to be negative, not positive. I.e., the net positive accumulation of ice in Antarctica is working to decrease sea levels. Ike: Why do you criticize me for using papers from 2012 when you quote the IPCC from 2013, which only considers papers from 2012 and before? These IPCC predictions are conservative and they even say that they would be a few tenths of a meter higher if a collapse of marine-based sectors of the Antarctic ice sheet is initiated. Well, guess what!, NASA just informed us this year that such a collapse is underway. 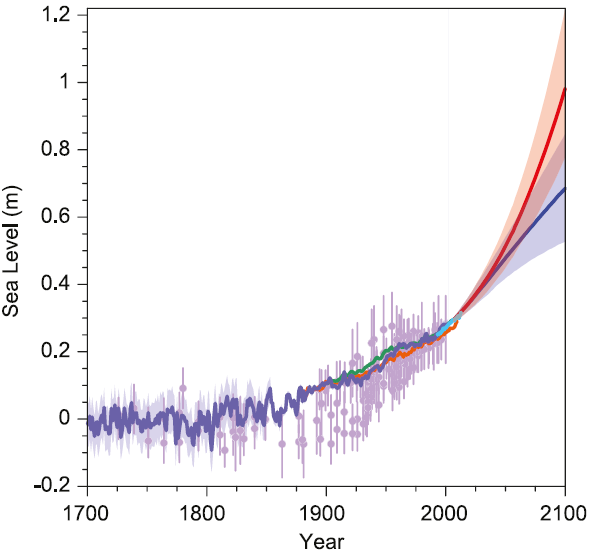 That put’s the upper limit of the IPCC’s predictions at 1.2 to 1.5m this century. in any case sea-level rise is going to be a very serious problem for the future, made worse by every ton of CO2 that we emit. And it is not going to stop in the year 2100 either. By 2300, for unmitigated emissions IPCC projects between 1 and more than 3 meters of rise. Thank you for referencing a chart from IPCC 2013. BTW, even though you missed it, they did reference many 2013 studies and data, including Giesen and Oerlemans (2013), and Radić et al. (2013), both specifically on the topic of sea level rise. The chart you showed and the chart I showed are consistent with each other and are based on the same outputs from the same models/simulations. These are the same suspect AOGCMs that the IPCC acknowledged have failed miserably in their temperature predictions, but there is simply nothing better at this time. Even as they overestimated temperature increases by several standard deviations, these models have likely overestimated long-term sea level rise. Nevertheless, I accept these as the best predictions available and rate them with the same poor confidence that the IPCC does. The near-term data and predictions show a spike in sea level rise, and the longer-term show a logarithmic decay. The IPCC admits that, “for the first few decades of the 21st century, regional sea level change will be dominated by climate variability superimposed on the climate change signal.” In other words, natural climate variability (demonstrated by such things as the significant warming of the Arctic in the 1930s that climate scientists in general and the IPCC agree was not a result of forcing) has a magnitude large enough to account for everything seen so in the recent spike, and the signal of sea level rise due to forcing will not be unambiguous unless it continues to rise for some decades yet. However, there is already evidence it is slowing rather than accelerating. Since you think the latest data is more accurate, here is a paper published in 2014 in Nature that finds sea level rise is decelerating (http://www.nature.com/nclimate/journal/v4/n5/full/nclimate2159.html ). The truth is that our data collection on ice pack and sea levels is far too limited in geography and time to say anything with confidence about the long-term trends for either, and the IPCC scientists admit it. That is why they say it is impossible to calculate the uncertainty (error bars) of their predictions and all they can do instead is to plot the extreme high and low outputs of various models. Using such thin justification as a basis for a radical restructuring of global primary energy is akin to having a papercut on a finger and deciding to amputate the arm to avoid infection, just in case. The so-called “precautionary principle” is a prescription for overreacting in ignorance and inflicting needless damage upon ourselves and our environment, and the policies enacted so far are having just this effect, while achieving no perceptible change in global atmospheric GHG trends. Ike: The bottom line is that you like to pick out specific citations from climate scientists (and specifically, the IPCC), yet you deny their own conclusions. You also compare the impacts of climate change to a paper cut! How about the American Association for the Advancement of Science? 3. The sooner we act, the lower the risk and cost. And there is much we can do.Waiting to take action will inevitably increase costs, escalate risk, and foreclose options to address the risk. The CO2 we produce accumulates in Earth’s atmosphere for decades, centuries, and longer. It is not like pollution from smog or wastes in our lakes and rivers, where levels respond quickly to the effects of targeted policies. The effects of CO2 emissions cannot be reversed from one generation to the next until there is a large- scale, cost-effective way to scrub carbon dioxide from the atmosphere. Moreover, as emissions continue and warming increases, the risk increases. Are you going to make policy recommendations based on scientific consensus or on political consensus? As you likely know but seem to be intentionally obscuring, there is exactly one document produced each IPCC cycle that is actually written by the body of scientists themselves and that represents their true scientific consensus — The Working Group 1 Report (WG1R). Everything else is written by political delegates who are hand-picked by their governments to loyally represent their host government’s political views. The politicizing of the scientific work product begins with the Summary for Policy Makers (SPM), which this year directly contradicted WG1 as well as containing new “facts,” fabricated by governments, not reported by scientists, such as the claim that scientists were now 95% certain that climate change was caused by human activity. That claim only exists in the forward and SPM, not anywhere in the 2,216-page scientific consensus, and it was added as political packaging by political delegates who needed to manufacture an alarmist soundbite because the scientists failed to deliver in AR5 the dire predictions they were expecting from the 2007 AR4. The SPM was so miserably politicized and false, that one of the lead authors of the WG1R (and the 20th most-cited climate scientist) in the world resigned. He gives the inside story of how the political sausage is made here (http://richardtol.blogspot.nl/2014/04/ipcc-again.html ). All the subsequent reports of each AR cycle are political add-ons, not scientific works. The link you provided to the latest UN report mentions how it was authored by “delegates” and “top scientists” (aka, the handpicked “state scientists” loyal to defend the ruling governments’ interest). And just like the White House National Climate Assessment released this spring, these reports use alarmist language from the 2007 AR4 instead of 2013 WG1, and directly contradict the most recent scientific consensus because it doesn’t inflame the panic they need to keep hold of their political offices. IPCC 2013 WG1R represents the current scientific consensus of 2,500 international climate scientists who reviewed thousands upon thousands of peer-reviewed papers and the latest evidence through much of 2013. It is a crime against science to confuse any subsequent political document with it, to give any subsequent political document equal footing with it, or to accept and promote any politically-authored claims that contradict the scientific consensus. Once again you “cherry pick.” Both of your citations are 2012 when the Arctic ice coverage was at its recent minimum and the alarmists were shrieking. Why do you reject the September 2013 IPCC report written by 2,500 international climate scientists that considered thousands of such papers as you cite and a wealth of data sources and developed the official climate consensus from a weighted evaluation of all the evidence? The chart from the IPCC AR5 report is below and it shows a negative contribution to sea level rise from the Antarctic. Can you comprehend what that means? There has always been seasonal and regional melting of glaciers and calving of icebergs and other forms of ice loss. The question is the net balance of loss to gain. It is irrational and immoral to trumpet only the negative and ignore the positive. The ethics of true scientists require that the whole equation be evaluated. The Antarctic ice sheet is not collapsing. And, if you look at the chart, the global sea level rise predicted by the IPCC is actually slowing logarithmically, not increasing exponentially as you claim. The IPCC is doing the math of mass balance. Why won’t you? The hard fact is that for the most part, the technology needed to make energy both clean and cheap does not yet exist. A commitment to accelerate energy technology innovation would help close that gap. That is not merely a matter of throwing more public money at R&D. For one thing, more public money will be hard to find as the government budget is increasingly dominated by the demands of entitlements and interest payments. Within another seven fiscal years, according to CBO analysis, 100 percent of federal tax revenues will be consumed by entitlements. All other government functions will have to be paid for by ever more costly borrowing. The alternative, obviously, is for the government to finally do what it has continually avoided for the past three decades: Reform entitlements to reflect demographic and economic realities; reform the tax code to be both efficient, fair, and attractive to business development; and restore a disciplined, orderly budget process. Achieving that may require reforming the electoral process to end gerrymandering, open up primaries, and require members of Congress to spend more time actually legislating than raising campaign money. Meanwhile there is much that can and should be done to make the innovation process more dynamic, efficient, and speedy. That includes opening up science and innovation to broad participation and engaging scientists, inventors, and entrepreneurs in developing countries as equal partners, not just as aid recipients or sales targets. For details on why a fundamentally different approach to innovation is needed, and how to make it work, see: http://j.mp/NrgInnov. With improvements in turbine technology, wind energy is one of the most affordable forms of electricity today to meet clean energy and carbon reduction goals. However, the challenges and Achilles’ heel of wind integration lie in the intra-hour variability and uncertainty of wind, making wind energy a difficult resource to dispatch. The challenge is to find a way to make energy created by wind generation, solar and other intermittent resources available on demand to meet current and future load growth. By Andy Kadak President, Kadak Associates, Inc. I completely agree with Senator Murkowski. The poor are more harmed by poorly conceived, some say feel good energy policies. In Rhode Island, there is a proposal to build an offshore wind farm that will cost twice as much as more traditional forms of electric generation. This does not make sense especially for the poor. What we need is a rational energy policy, which we do not have, that recognizes the cost of power for the short and long term. We used to worry about global warming but the globe has not warmed for the last 10 t0 15 years so we switch to “global climate change” whatever that means or how measured to justify spending huge amounts of money in the form of subsidies (increase in taxes) and costs (direct increases in electricity bills) to justify solar and wind and biomass electric generating stations. As Senator Murkowski’s question implies, these hurt the most vulnerable of our society. The meme that there has been a pause in global arming is not supported by the facts. The oceans absorb 90% of global warming heat and warming of the oceans continues apace. Also, August 2014 was the warmest August since temperature records began and 2014 is on track to be the warmest year since temperatures records began. A record high is not consistent with a pause. Of course, global warming is with us now. The volume of the summer Arctic sea ice has dropped 70% in the last 30 years. Extremely Hot Summers (more than 3 sigma above the average for a given location) are up 5000% in the last 50 years. I could go on. Denying that global warming exists will certainly not serve the poor, who are disproportionately hurt by the impacts of climate change. Once again, Dan, the UNIPCC recognizes the hiatus in global warming dating from 1998 in their official 2013 AR5 report. If you are going to insist this reality is just a false “meme,” then you are putting yourself in opposition to the most authoritative climate consensus there is, and properly deserve the label of a “denier” of climate science. P.S. September 2014 was the warmest September ever recorded. I hope others can appreciate the logical fallacy you just illustrated. You just attacked the 18-yr hiatus in global warming as being too short an interval from which to gauge climate, and then used the month of September 2014 to argue climate is warming. I could use the months of January and February to argue the climate is cooling, or the fact that there was ice on the Great Lakes into July this year, or that cold temperature records that date to 1880 were broken in parts of the US this summer. The nature of records in climate, like records in sports, is that new ones are always going to be set, particularly for particular dates or months. It is a false premise to argue climate from weather, as you do above. Why do you reject the IPCC science and run to an agenda site like realclimate.org? I’m not citing Heartland or WUWT, I’m directly quoting the IPCC scientists. P.S. Colorado just had the earliest snowfall ever recorded this September (http://www.csmonitor.com/USA/Latest-News-Wires/2014/0912/Record-early-snowfall-blankets-parts-of-Rockies-states ). You have it turned around. You have been arguing that short-term variations in the advance of global temperatures implies that global warming has stopped and/or climate scientists are wrong. Since you are cherry picking data, I just highlighted some record global temperatures and pointed out that you can’t have peaks during a pause. And while it’s true that record global temperatures can happen anytime, the chances that 3 records could be broken within one decade (and the 9 of the 10 hottest years ever happened within the past decade or so) shows the process is not due to normal variations around an unwarming world. Also, you can not point to January or February as cool months… they were among the hottest ever recorded. The Eastern US was cool, (like it used to be!) but that only represents less than 1% of the surface area of the globe. By 2050, the coolest summer ever (globally) will he hotter than the hottest summer of the 20th century. The changes underway are not subtle. RealClimate is a site run by climate scientists, so you can’t compare it to non-scientific denier sites like WUWT. The fact that you are reading those sites explains why you doubt climate science. These claims were all trumpeted from the rafters in AR4. These claims have all been fully recanted because of contrary evidence (droughts, storms, deforestation, disease), or downgraded to indeterminate uncertainty for lack of evidence and scientific consensus (the rest) as documented in AR5 WG1. In 2005 Norman Myers of Oxford and the UN and UNEP predicted 50 million climate change refugees by 2010. Well just this year we hit the milestone of 50 million refugees worldwide — but they are refuges of violent conflict, not climate. Might the international community be wasting immense national resources focusing on the wrong crisis? (http://www.huffingtonpost.com/2014/06/20/world-refugee-day_n_5514414.html ). Ike: Those are all predicted impacts of climate change and no major group I am aware of has recanted them. Some current impacts that can be attributed to climate change include increased drought, deforestation (have you heard of the Bark Beetle? ), and accelerated sea level rise (going up at 3mm/year instead of 2mm/year). I know you would like to frame the issue as “everyone said disaster would be here by now and they are wrong, so the whole thing is a fraud.” But that is not what the IPCC said. They have generally underestimated the speed and scope of impacts, such as predicting we would see an ice-free Arctic by 2100. Some impacts are here and more are on the way. And we can’t just turn them off later when we decide we don’t like them. The time to act is now. Fortunately, acting now will create jobs and grow the economy, so it’s a win-win. As for refugees, I’ve never heard anyone predict a large number of climate refugees now, but you try to pull out one reference, say it’s wrong and therefore “prove” all of climate science is wrong. Sorry, it doesn’t work that way. If that was a peer-reviewed study you were referring to, you should write to the journal editor. The Syrian crisis has created a lot of refugees and it is probably more than a coincidence that Syria just suffered through its worse drought in modern history. Climate refugees don’t always look like climate refugees. Yes, when sea level rise further, we’ll be able to point to people fleeing Bangladesh and island nations, but nearer-term, it will be people fleeing social unrest caused by high food prices, drought, and famine. So the bark beetle is your evidence of global deforestation due to climate change? How about consulting the experts? AR5 says the evidence is that plant fertility and food crop yields are increasing, and the Earth has 6% more green plant coverage now than in 1982. Now, that is exactly the effect that rising CO2 should have on plants. Yet the alarmists have to find a way to spin this into a horror story. Ike: CO2 can indeed lead to increased plant growth, as long as other factors remain favorable for growth, such as the availability of water and appropriate temperatures. I believe famers in Russia, Texas, California, Syria, Brazil, and many other places might beg to differ that increasing CO2 in the atmosphere is a net advantage. In the longer run, drought (and floods) and high temperatures will overwhelm any “fertilization” advantage of CO2. Senator Murkowski wants to identify a measurement for evaluating the impact of rising energy costs. That is probably ok, but it does not affect the rising energy cost itself. As I understand it, she is advocating what appears to be an index, a measurement of the affect of rising energy cost. If indeed that is the case, I do not see how it will be of much help with the real problem, which is the cost itself. We need to mitigate the dramatic increase in the actual cost of producing and delivering electricity. The cost escalation is already getting baked into our power supply system, and will be realized by the entire population soon enough. Higher prices will harm the poorest among us first. Ultimately the well off will have to deal with the pain. When that happens the entire economy is in big trouble. I sure hope the Feds will be able to print all the money we need, especially now that we have another war to fight. Despite the dramatic efficiency and reliability improvements of conventional power generation, transmission, grid operation and power distribution; we shall off set all of it by degrading the system to improve our weather. Our engineers and investors, given the time and money, may well come up with more practical and efficient ways to manage the unreliable wind and solar generation that has been forced onto the grid for political benefits. But only natural gas will be able to off set the near term losses of coal and nuclear fuelled generation. And that will require huge investments. Future innovation and technology will not be available soon enough, if ever. A ready index for Ms. Murkowski is the fraction of income a household spends on essential energy services (space heat and cooling, water heat, cooking, sanitation & hygiene, lighting, transportation, telecommunications, etc.). That fraction of income is a function of income, cost of essential energy services, and energy efficiency. The most common internationally recognized threshold for energy poverty is when more than 10% of income is consumed by essential energy services. Energy poverty can be alleviated by reducing the cost of energy, increasing income, or increasing energy efficiency. Senators Murkowski and Scott’s proposal for “Indicators of Energy Insecurity” are measures of energy costs for U.S. households and impacts on low-income households. While these measures are important to consider, they are not a complete description of all the criteria that need to be evaluated in choosing between alternative energy policy options. Other important criteria are: national and regional economic growth, environmental impacts including greenhouse gas emissions, job opportunities over time, energy costs in different sectors of the economy, and energy supply security. Currently, various special interest groups, such as oil companies, coal companies, environmental organizations, and state governments lobby federal politicians to support policies that are in their own interest. Major energy policy options are complex to evaluate and should not be decided by the power of any particular special interest group but rather by what is in the overall national interest. While I was a visiting professor at Stanford University in the 1980’s, Prof. George Dantzig and I proposed the “Multiple Input Decision Formulation Approach (MIDFA)” as a means to do comprehensive energy policy analysis and provide a framework for special interest groups to understand and communicate on the issues. The general idea of this approach is to create a forum where special interest groups work with the managers of the process to identify policy options and the key criteria to measure their effectiveness. Then the managers of the forum would invite leading objective analysts to quantify the range of impacts for each policy option. For example, a policy option for the electric power sector could be to replace all coal-fired power plants with renewable solar/wind/hydro/geothermal power supplemented with natural gas as necessary and a new national smart electric power network. An organization like the Electric Power Research Institute (EPRI) could be invited to evaluate the feasibility, energy costs, and environmental impacts of this option, and economic modelers could evaluate the national GDP, regional, and job impacts of such a transition. Other economic policy options such as carbon taxes and income support for low-income households could also be examined in tandem with such energy infrastructure policies. The MIDFA process would provide the objective, comprehensive analysis necessary for special interest groups to properly understand the range of impacts of relevant policy options they wish to consider. Ultimately, this should lead to the United States creating a consensus for a national strategic energy plan that best meets its long-run economic and environmental objectives. The water-energy nexus gets little attention in this otherwise comprehensive and well done position paper. Wet cooling of coal and nuclear power plants evaporates 1.8 liters of fresh water into the atmosphere per kWh of electricity, making power generation the largest water hog of all, and in India there is already a fight over the huge consumption of scarce fresh water for electricity. Oil sands processing pollutes 4 barrels of fresh water for each barrel of bitumen produced, and the output of the Keystone XL pipeline will go to the world market (and therefore will not help US energy security), but this egregious example of rip-and-ship resource extraction gets endorsed. The copious fresh water withdrawals of frackers are not mentioned, nor is the problem of earthquakes and leaks from the underground injection of fracking wastewater. The DOE’s flagship CCS project, FutureGen, will displace salty formation fluids which could wind up in the groundwater, but nothing is said about the catastrophic water impact of CO2 sequestration or the doubling of water consumption if amine scrubbing for CO2 capture is added to coal plants. Water is a huge consideration for evaluating energy alternatives. Coal electricity has a water footprint of 22 liters of water for the energy equivalent of a liter of ethanol energy. The diesel and gasoline water footprint is 23 liters per liter including all the drilling and injection and processing steps. But, corn ethanol has a water footprint of 2,855 liters per liter, soy biodiesel has a water footprint of 11,397 liters per liter, and jatropha biodiesel has a water footprint of 19,924 liters per liter (see waterfootprint.org, the official site recognized as authoritative by UNESCO). It is often not appreciated that fossil fuels have greatly reduced civilization’s dependence upon environmental resources to power its economy. Previous empires doomed themselves by deforesting all their land for firewood and food agriculture, but in this industrial age, forests have been growing rather than shrinking since the 1950s. Water for energy competes with water for food. 1/3 of the world’s nations are water poor today and 2/3 are forecast to be water poor by 2050. It is the increasing agriculture needed to feed a growing population with a growing appetite for meat that is going to place far more stress on water resources than power plants. Trying to also use that water and land for bio-energy is a fatal error. As to fracking, the growing trend is now to draw water onsite from deep saline aquifers, use it for the fracturing, and then purify it to local water quality standards for local release. Thus, previously inaccessible salt water is being made accessible and fresh. This phenomenon is driven purely by the high cost of transporting water and paying to inject the used water into waste wells, not altruism. The existing environmental costs imposed by regulation drive responsible and even beneficial behavior. The abundant energy from the freshly fracked well can be used onsite for immediate water cleanup before the pad is cleared. There is also much recycling, especially since a single pad is now often drilling as many as 20 horizontal wells. Depending on the relative economics of gas and water, such drilling can be optimized as a way to use water to get gas, or a way to use gas to get water. Places in the world that are rich in gas or source rock but water poor, may actually find fracking to be a way to produce significant quantities of fresh water. How about that for a paradigm shift? How many strategists in the Pentagon are working out the implications of many more nations having cheap and accessible and domestic energy, and how that will cause tectonic shifts in a geopolitical structure that currently favors petroleum-exporting states with rentier economies? Probably not enough because too many are being tasked to ghostwrite climate change catastrophe papers for their bosses. The predictions of these papers are likely to be as accurate as their predictions were for the price of oil, which was supposed to be approaching $250/barrel right now according to Joint Forces Command, and gasoline on its way to $9/gal according to the Navy. Here’s the Navy’s May 2012 vision of the dystopic energy future it is using to justify its biofuels program http://youtu.be/wKXrIWsuxnE. As global oil prices are collapsing around us and OPEC is in a civil war to preserve market share, you be the judge of their predictive accuracy. You should also rate the wisdom of their kitten-like fascination will the hyped cause du jour instead of maintaining a balanced focus on all the threats and navigating with a deeper understanding of science and economics and geopolitics. The issue of energy poverty in the U.S. is not so different from that in the developing world. Although they employ different technologies, the bottom line for both populations is a lack of economical CLEAN energy. Although coal is the cheapest of the primary fuel sources for electricity, the environmental costs are unacceptable, and I am not referring to only greenhouse gases (GHG). For example, the massive expansion of coal generation in China has led to a decrease in life expectancy measured in years. To describe coal as “increasingly clean” is something of an oxymoron. Even if you capture the CO2, which suddenly results in coal power no longer being cheap, you must then sequester it. In other words, you still have a waste disposal problem. Renewables are still expensive, especially considering the issues with intermittency and dispatch. Storage would help but these technologies are also expensive and immature. Big hydro and nuclear also have their own sets of issues. Natural gas teamed with renewables appears to be the best short to medium term solution. But, whether fossil or renewable, many of the environmental concerns emanate from the scale of development. It is interesting that in the American West we are talking about dismantling much of the large 20th century hydro infrastructure at the same time that China and Africa are building gigawatt scale hydro projects. But gigawatt scale wind projects in Wyoming to supply southern California via an 800-mile tie line also make little sense. To provide economical electricity to energy thirsty regions, underserved areas, or those, such as in Alaska, that rely on fuel oil for generation we should ask “If we had to start over, what would the grid look like?” The answer appears to lie in the modern technologies such as microgrids that allow for localized and distributed generation (DG). The other area in which innovation is sorely needed is utility regulation. Utilities commissions are supposed to ensure that rates remain cost based and are “just and reasonable” but the regulatory compact is a mess. Such commissions, which often as not suffer from “regulatory capture” even in the best of circumstances must allow utilities to pass along the costs of environmental regulations and renewable mandates. Community choice aggregation, which is allowed in only relatively few jurisdictions, perhaps offers the best opportunity for local communities to claw back power from monopoly utilities and serve their own needs rather than those of institutional shareholders. Last, the constitutents’ concerns expressed in the paper by Senators Murkowski and Scott are very real. But many, if not most, of the solutions that I and others have discussed here may appear too abstract and academic to the mother who is struggling to feed her family and heat her home. With that said, the senators’ paper highlights one important economic reality which is that energy prices are only one component of the larger economy. And, just as in the developing world, it is difficult to tell a struggling family that they should be concerned with the long term impacts of climate change when they cannot survive the week. So, while we should strive to keep energy prices as low as possible, there has been insufficient attention paid to the job growth that might help make the rising energy costs more palatable. You have written a “blueprint for discussion” in your 20/20 Energy paper. I appreciate your willing to have a discussion about energy policy but I am afraid that the primary reason to have that discussion needs to rest on an understanding of the destruction that will come our way if we don’t make major changes in the amount of heat trapping emissions we continue to release into the atmosphere. Our move away from burning fossil fuels, the primary culprit, needs to happen within the next ten years according to 97% of the scientists who have looked at the issues. There is no argument. Can we start there? We all value your primary parameter for a new energy policy; the need to keep energy costs down … because even a small increase can devastate families living on low incomes. Here are some examples of a decarbonized future that actually save the consumer money over the life of the changes, in addition, the EPA’s modeling shows the average monthly electric bill will be $8 lower in 2030 with the Clean Power Plan than without it. There is no reason to believe ‘clean’ energy will increase energy bills. Wyman’s, a blueberry grower in Maine who runs 24/7 during harvest season, has installed new systems that save more than 1 million kWh a year. Bob Stanley, Director of Engineering at Wyman’s, explains that in August when the bagging operation runs 24/7 and the company’s equipment is running at capacity, it puts quite a load on the electric grid. Reducing that load with on-site efficient cold storage and efficient processing equipment is good for the grid as well as for the company. In Rhode Island, lighting efficiency upgrades resulted in an annual savings of 15million Kwh, leaving one school system with additional funds to spend on education. Like Wyman’s the school had access to partial up-front funding created by the Regional Greenhouse Gas Initiative. Equipment and retrofits can make huge energy savings but the upfront cost is high. The customer is basically prepaying their bill. Significant savings come later in the life of the retrofit. The Empire state building retrofit saves $4M/annually and 38% of its former use. Templates have been created to show how buildings, which use 70% of our electricity, can be run on 50+% less energy. We just need to expand the private sectors ability to create loans that a customer can pay back with the savings from their utility bills. PACE loans are one method. There are others. None add to public budgets. A goal you state that we can also all value. As you say, we need to remove roadblocks … change some rules. California’s electricity consumption has remained little changed over the past 40 years, even as the state’s population doubled and its gross economic product tripled. Economic growth occurred without requiring additional energy. The reason … in the 70’s during his first term as Governor Jerry Brown reformed the way California utilities were regulated by changing the way their profits were calculated. Today, profits at many nationwide utilities remain based on how much electricity they produce, requiring more generating capacity to create more profit. California has shown us that economies can grow without a corresponding growth in energy use. The three-year “National Offshore Wind Energy Grid Interconnection Study” (NOWEGIS) estimates that the 54 GW of offshore wind could reduce national annual electricity production costs by approximately $7.68 billion. Experts from Duke Energy, ABB, AWS Truepower, DOE’s National Renewable Energy Laboratory (NREL), and the University of Pittsburgh – Swanson School of Engineering found that the United States has sufficient offshore wind energy resources to generate at least 54 GW of offshore wind by 2030, and that resources are available for significantly larger amounts. The change is especially hard for Alaska where the budget is so dependent on the fossil industry and where citizens actually receive a fossil check every year, but ‘Clean’ cannot be a relative matter. It would be better to have a transition plan. Seems like a great way to ”relieve energy insecurity and decrease costs for the American people”! If you’re going to resort to the “97% consensus” and “there is no argument” and “the science is settled” — on any topic — then you immediately disqualify your opinion as unscientific. Since your whole comment is predicated on this argument, please tell us the basis for the 97% claim. How many scientists does it comprise? What academic specialties were included? How were their views determined? Were any scientists’ views not included? What exactly are the elements of the consensus? I know these answers because I’ve researched it in depth, but I would like to give you the first opportunity to reveal how firm a foundation you have in this token appeal to experts. I hope you wouldn’t use such a dismissive tactic if you didn’t know the answers to the above and weren’t quite convinced it was a valid claim. So you badger Ms. Murkowski based on something you heard secondhand and just accept on faith? There’s a lot of bandwagoning in place of science on this particular topic. The page you linked is informative. Did you bother to scroll to the bottom and look at the dates of the references? Does it seem odd to you that most of the statements and references are to IPCC AR4 from 2007, the year of peak global warming alarmism and Al Gore’s Nobel Prize? The continued reference to AR4 and shunning of AR5 is also true of the White House National Climate Assessment that came out a couple of months ago. It is no accident. AR5 WG1 has been out for over a year, but once folks have jumped on the bandwagon and cried wolf in public, it is hard to walk it back. Yes the officers of many scientific societies published statements on climate change years ago riding the tide of climate hysteria, but even then it was usually accompanied with heated debate and even the resignation of some members. The most vocal dissenters and resignations happened at the American Physical Society. It is interesting that they are now reexamining their position (http://www.aps.org/policy/statements/climate-review.cfm ). On the issue of the “97% consensus,” it is informative to note that that the number of scientists whose opinion is considered in the handful of studies that support this claim is not 97% of the 7.6 million full-time international researchers in recognized scientific fields. Nor is it is 97% of the 1.5 million American scientists. Nor is it 97% of actively publishing climate scientists. In fact, the much heralded consensus is only based on about 1/3 of the 10,000 most actively publishing climate scientists who were even sent a survey and who chose to voluntarily return it. In other words, “97% of scientists” refers to a total of about 3,300 people, and they happen to be those whose continued funding most depends upon perpetuating climate panic. This is like gauging the opinion of the general public by only those people who call in to rant on a talk radio show. Even more revealing is the actual substance of the consensus. It is generally and mistakenly assumed to be agreement that there is a looming man-made climate catastrophe that requires immediate drastic intervention to curb CO2 emissions to avoid. In actuality, the survey questions behind the consensus are typically something as non-committal as this question from Doran’s 2009 survey that reported 97% consensus in a published, peer-reviewed science journal from a poll that only included 3,146 total respondents: “Do you think human activity is a significant contributing factor in changing mean global temperatures?” (Doran, Peter T., and Maggie Kendall Zimmerman. “Examining the Scientific Consensus on Climate Change.” Eos, Transactions American Geophysical Union 90, no. 3 (2009): 22–23. doi:10.1029/2009EO030002.) This question requires no consensus on even the direction of temperature change (warming or cooling) let alone that humans bear a major or principal role, or that there are negative consequences of climate change, or that urgent action is needed, or that CO2 is the causal mechanism, or that curbing CO2 emissions is the proper path for mitigation, etc. When the survey question is made more specific by including any of the elements above, or when the aperture of surveyed scientists is opened to less vocal climate scientists or to publishing scientists in other disciplines or to all scientists, the consensus percentage drops dramatically. The 2013 IPCC AR5 Work Group 1 report itself (not the forward and not the Summary for Policymakers) represents the consensus of several thousand international climate scientists. Compared to the 2007 AR4 report, it cites much new evidence and research, but also admits much more uncertainty, and it is far more scientifically conservative in its predictions and tone. Unfortunately, such a document does not support the rabid agenda of politicians who need manufactured existential crises to justify onerous taxation and power grabs and to distract their constituents from far more immediate and damaging domestic and foreign policy failures. If you want to cite a consensus, you should cite specifics from the published 2013 IPCC AR5 WG1 report, not non-specific survey results from years past turned in only by the most vocal minority of self-promoting climate scientists. It’s long overdue for the hard scientists such as physicists and chemists to crash this club of glorified weathermen, and they finally are. And what is coming to light are gross misunderstandings of basic physics in the underlying theory that explain why the models don’t work. There is a big shakeout in the works and the current toxic tide of climate Lysenkoism is about to be rolled back. Anyone who ever said “the science is settled” is going to find themselves on the wrong side of history when true skeptical science again holds sway. Fortunately, the internet never forgets. Good heavens! Badger Senator Murkoski? I don’t think so. Disagree? Yes. AND NASA said “97% of climate scientists agree” … not ALL scientists. I have not read through the transcript of the workshop by the APS, but I must say that they seem to be proceeding normally with a five-year review of the Society’s 2007 statement. They also state that the workshop will not be the final technical input and that their findings will be discussed further by the full subcommittee and the broader APS membership. Sounds reasonable … the “sky isn’t falling”. I am a reporter and advocate … and have never pretended to be a scientist. I believe, from the credible sources including NASA, that I have read, that we need to stop emitting green house gases as soon as possible, methane in particular, and that doing so gives us a shot at not destroying our earth. I also believe it is very possible to stop emitting greenhouse gases if we create a plan to clean our air and transition to alternative sources of energy generation. Powerful industry interests are keeping us from doing what is necessary … the tobacco wars returned. Do let us know when the whole APS reaches their new conclusions. For the last 40+ years the holy grail of U.S. energy policy has been a source of energy that was domestic, super-abundant, and cheap. Lately, it also has had to be clean. I have called this the panacea technology since it would solve all of our energy dilemmas at once. But of course, we haven’t found it. As Lewis Perelman aptly states, “the technology needed to make energy both clean and cheap [much less superabundant and domestic] does not exist,” despite the federal government’s many attempts to make it happen. One part of Senator Murkowski proposal is good: We should have some regular measure of how much energy price fluctuations are affecting people in the U.S., and I believe the government is best placed to provide that sort of information. I have heard complaints personally, especially by the elderly on fixed incomes, of how high electricity prices and gasoline prices put them in a financial bind. But I don’t see exactly what the federal government can actually do besides provide information and maybe the LIHEAP. Certainly, the government should never try to regulate prices (unless the goal is a shortage) and it should equally not be up to the federal government to try to push any one technology to solve America’s energy problems. Since many perspectives see the goal of energy policy to make fossil fuels expensive, I can understand the need, expressed by the senator’s post, to recognize the trade-offs. Better still would be for Congress and the president to admit that they have no ability to judge what energy technology the future will find most useful, and to let the market decide. There is of course the issue of climate change, but even that leads to confusion, more than clarity, with respect to energy policy. Mandates for wind, solar and ethanol are not identical to cuts in CO2; indeed it may be reasonably argued that any alternative energy mandate will fall far short of any supposed correlative emissions target. In other words, a 30 percent RPS does not equal a 30 percent reduction in carbon dioxide emissions. Look at Germany, the poster nation for solar and wind. Emissions of CO2 have gone up as coal has increasingly been used as backup to the intermittent solar and wind generation so recklessly expanded. There is no getting around the problems of intermittent renewables no matter how attractive. I would add finally for those who cite the 97 percent consensus for climate change (presumably based on the Cook et al. paper that made that claim) that they should read the comments of Richard Tol that appeared in the journal Energy Policy. Tol, in no sense a “denier,” showed that the 97 percent claim was based on analysis that was so flawed that it should not be taken seriously DOI: 10.1016/j.enpol.2014.04.045. There are important questions with respect to energy policy; too bad, that politicians as well as pundits, often fail to understand them. I support the Senator’s view on the need to balance energy security, the environmental impact of energy production and use, and energy affordability. A reasoned debate on balancing these factors requires some metrics. Metrics for security (e.g. oil imports, exports from at-risk regions) and environment (e.g. CO2 and other emissions, habitat impacts) seem to be developing faster than metrics for affordability. The White Paper seeks to address this gap, and examines the affordability of household energy – that is, heating, lighting, appliances and electronics, and cooling. The White Paper explores “energy insecurity” for two population groups – those near or below the poverty line (2014 guideline of $23,850 for a household of 4 – c. $4-6,000 higher in Hawaii and Alaska) and those who spend 10% or more of household pre-tax income on household energy (roughly 4 times the national average). The calculated conclusion is straight-forward – as the cost of energy goes up, even modestly, it is the households with low incomes and high energy burdens who can least afford it. However, the larger point as this: the White Paper has proposed some metrics – Indicators of Energy Insecurity – which can be used to assess the impact of proposed energy policies on a vulnerable segment of the US populace. The White Paper does not argue for seeking to limit energy price increases – either those arising from market forces of supply and demand, or those arising from putting a price on carbon or from phasing-in higher-cost sources of energy. But it does call for examining ways to temper the impact of energy price increases on those living in “energy insecurity”. Over time, other good measures of energy affordability will likely gain acceptance, but for now, I think consideration of the Indicators of Energy Insecurity is an important step. Additional background: Reprising the White Paper, in 2012, the US average household energy costs were $1945, or about 2.7% of household income. (While not studied in the White Paper, annual gasoline costs averaged another $2912 per household). For most Americans, moderate increases in energy costs are annoying, but generally absorbable. But these are average numbers, with average annual household income at just over $70,000. Energy price increases are much more challenging for low income households. The idea of monitoring the effects of policies on the poor, including energy policies is laudable, but should not stand in the way of needed reforms to address climate change. Policies that result in higher energy prices should take account of the effect on the poor and at least commensurately reduce the burden on poor people. A simple example might be expanding the low income heating assistance program using carbon revenues. The poor need to be protected from what would otherwise amount to regressive tax policies, but we need to move forward on ensuring that energy prices fully reflect environmental costs. That can certainly be done while holding the poor harmless, or better yet, helping to lift them out of poverty. One interesting use of these tools might be a retrospective on the 2009 economic collapse. One day on the news, people were interviewed on TV who said: “With gas prices rising this fast, we won’t be able to pay our mortgages.” And then, not so long after, the rate of default on mortgages was just high enough (given the admittedly brittle structure of mortgage investment systems at the time) to be able to collapse all the banks. There is reason to believe that the main reason the Saudis are now holding the world oil price so low (by producing at such a high level) is to avoid a world depression; perhaps if the link is more explicit and widely known, it might help us all move to more of a win-win resolution. One potential use for such indicators would be in regulatory impact analysis. For example, when evaluating the benefits and costs of a proposed rule, EPA will quantify the human health and environmental benefits as well the costs to the regulated industries – but rarely includes analysis of the share of cost burden in the form of employment impacts or higher electricity prices. Where EPA does estimate electricity price increases, it does so on a state- and country-average basis. However, while a 1% increase in U.S. electricity prices may not seem like much to most people, the impacts on households in particular states could be quite significant. In this regard, an indicator assessment along the lines to what Senator Murkowski proposes would give a better picture of the impact of proposed policies. That would provide a more complete assessment of both the benefits of proposed rules as well as potential negative impacts so that better policy (or mitigation of those negative impacts) can be designed.